No light bulbs. No shower curtain. No hot water. Welcome to Sochi! ADLER, Russia – The late, great Rodney Dangerfield used to tell a joke about staying in a hotel so cheap, "they stole my towel." It's a classic, at least until you walk into a "hotel room" here at the Winter Olympics, see it has two beds … and just one pillow … and no light bulbs … and no shower curtain … and cold water only … and a door that can't close … and, well, truth be told, you're just happy there isn't a stray dog curled up in the corner. One of the great things about the Olympics is how the entire world comes together and immerses itself in the culture and way of life of the host city. This is a global community. It's not supposed to be three weeks of opulence and seven-star hotels – unless you're an IOC official or LeBron James, of course. It's, hey, you're in China, you'll live a little like the Chinese. Well, old Mother Russia has a treat for everyone. You want a Soviet snapshot? How about a brilliant testament to soulless central planning, federal inefficiencies, widespread corruption and inexplicable architecture, such as the now famous double toilets? This is meant in the best possible way. Seriously, this is something to marvel at, like a life-sized Smithsonian display of a bygone period. Besides, a lot of the construction here is beyond spectacular and will play exceptionally well on global television broadcasts, which is the point of the entire operation. It stands to reason the competition facilities (which are what matter) will be fine. The Games will go on. The tourists will just have to deal with it. Hopefully they'll see it as the comedy it is and not as an unfair inconvenience. They have so far. On Tuesday, two days before the 2014 Winter Olympics are set to begin, people stood around and compared war stories, leaning on gallows humor to explain, well, just about everything. To start, the word hotel means something different here apparently. On the list of say, hot water, a door capable of closing, a television, light bulbs, clean sheets, a properly hooked up toilet and one pillow per bed, any guest should make like the NBA Finals: take four of seven and pop some champagne. And bring light bulbs, they are so valuable on the black market you can trade one for a date with a Russian tennis player. It isn't all bad. They do have a lot of 24-hour bars here, so it's clear Russia's heart is in the right place. And the people, mostly volunteers, are trying as earnestly as possible. It's just clear there is little organization. That $8.7 billion highway up the mountain, more than the cost of the entire Vancouver Games, looks nice. Plus it's sunny and in the 50s, which isn't very wintery, but appreciated nonetheless. One of the other prime contenders was Salzburg, Austria. It's home to Mozart, the Sound of Music, breathtaking beauty and centuries-old infrastructure. In other words, exactly what the Winter Olympics are supposed to look like. Adler/Sochi won of course, even if it had yet to be constructed, much like the alpine facilities a couple of hours commute east of here. There is no documented exposé of IOC payoffs. However, you could win a jury trial just by asking how anyone of even moderate intellect could possibly have thought this would be a better idea than Salzburg. There's no way. So they had better been getting something under the table. There is something joyous for all about watching a strongman like Putin spend $51 billion constructing an Olympics to show off his modern and efficient country and thus far failing miserably. There is plenty of sterile, cookie-cutter construction, buildings identified with numbers upon numbers – come on by Omega 12 15-5-355 – utterly strange designs and grounds that lack not only minimal landscaping but a startling number of man hole covers. Then there are the dogs; lots and lots of dogs – although less by the day. A company has been hired to cull the herd, which may involve shooting and poisoning them, or maybe something more gentle. The Russians are claiming the latter, but when the guy who owns the company hired for the job calls the dogs "biological trash" on ABC, they don't sound too convincing. Still, this is all pretty entertaining – unless you are a dog, of course. The Canadian hockey team is reportedly going to sleep three to a room – all on small beds. They are still laying bricks in the street. 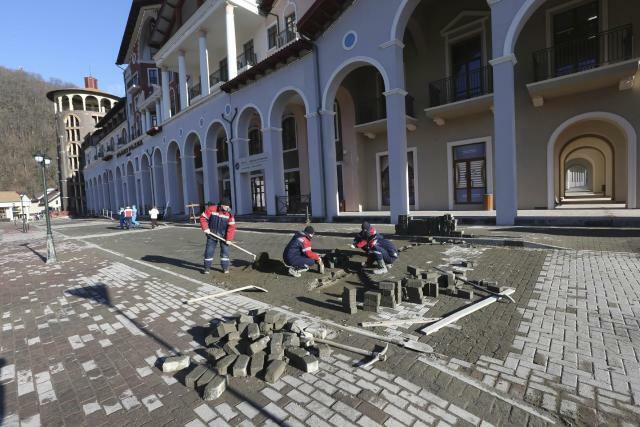 The opening of the Gorki Grand Hotel – the word "grand" means something different here also – is postponed. One of the Swissotels isn't bothering to open. Other hotels are "mostly done," as one maintenance person said, which is like saying Peyton Manning mostly won the Super Bowl on Sunday. Or maybe you don't consider a door an essential item for a hotel room. Damn Westerners. There is a lot still not done here and that has to humiliate Putin. It's one thing to dole out $51 billion to host the Olympics – more than any country has ever spent, including China which spent $44 billion to host the Summer Games in 2008. It's another to do it and not be ready. No one even blinks at corruption here. Inefficiency is an embarrassment. The most oft-cited culprit for the delays is the "rain." Apparently it's been pouring here for seven years. Right now everyone is laughing at Russia. From the photos going viral around the world to the snickering about an overambitious construction project falling short to the likelihood that posing in double toilet stalls will become the Sochi version of planking or Tebowing. The only bright side for Putin is no one is talking about gay rights anymore. Or terrorism. Yet. Meanwhile, the smell of saw dust fills the air and construction crews try to slap the entire thing together as more and more planes unload at the airport, more and more visitors arriving to find this wonder world of ridiculousness. This is Sochi. Or Adler. Or Putin's comedy act. Or someplace. It's certainly not Salzburg. It is where Rodney's old joke became reality.